A sweet bunch of orchids is a stunning gift itself and when it combines with the beautiful rakhi it makes the perfect gift hamper for Raksha Bandhan. 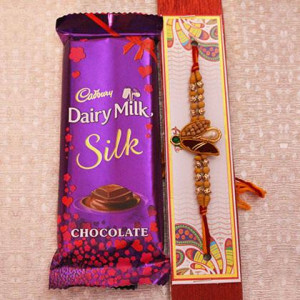 Thus, buy this exclusive combo for your loving brother that consists of Purple Orchids Wrapped in Pink Paper along with Rakhi Roli and Chawal. Blue Orchids are the symbol of royalty. 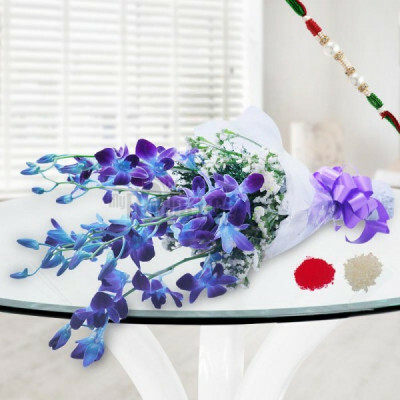 Thus, make your dearest brother feels royal with this exclusive Raksha Bandhan Gift Hamper that consists of a bunch of 6 Blue Orchids, Wrapped in Cellophane Paper along with Rakhi Roli and Chawal. A loving brother is just like all for one and one for all for his sister. This Raksha Bandhan, express your feeling of love towards your dear brother by this lovely combo that contains 5 Pink Asiatic Lily and Rakhi along with roli chawal. 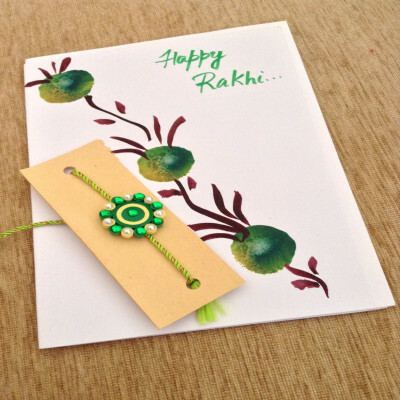 Raksha Bandhan is the festival that comes with a great pleasure. Individuals get enchanted to look for the unsurpassed for their dearest brothers. So, on this Raksha Bandhan place an order for this marvellous combo that consists of Half Kg Mix Dry Fruit Basket with Rakhi. The deliciousness of dry fruits adds a tempting outcome on the relationships between brothers and sisters. Their bonding becomes stronger and valuable with this combo of Beautiful Rakhi n 100 gm Cashews. Raksha Bandhan is a day of promise, faith and a mode to make an enthusiast bonding with loving brother. Thus, to make your rakhi festivities go on a mesmerizing path order a combo of Rakhi with Roli Chawal and 300gm Dry Fruits Basket. Strengthen your bond with your loving by sending a gift pack full of healthy delights including Almonds, raisins, pista, and Cashew Nuts. Make your occasions extra special with this alluring rakhi combo that contains 1kg Dryfruits and Rakhi with Roli Chawal. Raksha Bandhan is a pleasant festival to reinforce the bond you allocate with your brother. 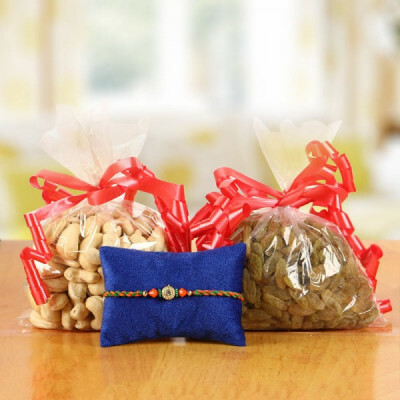 This year, send an attractive beads rakhi with dry fruits contains 100gm Cashew and 100gm Raisin with roli chawal to elegance the occasion. 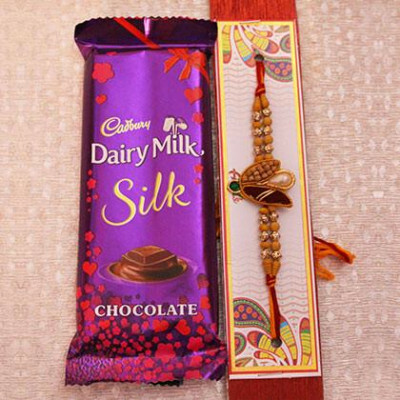 Tie this attractive and beautiful Rakhi to your brother this year on Raksha Bandhan. It comes along with roli and chawal for performing the rituals and half kg round pineapple cake which is very delicious also bundled along with these products. 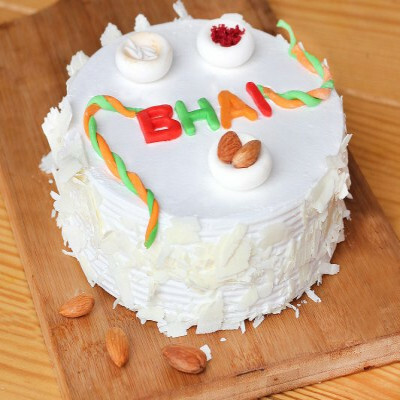 A charming heart shaped 1 Kg Heart Shape Vanilla Cake to state your love and care for your dashing brother. Enjoy your love and care for each other on this Raksha Bandhan with this appetizing delicacy, finest to send it to your brother along with attractive Rakhi Roli and Chawal. Lovely Half Kg Strawberry Cake to state your love and care for your beloved brother. 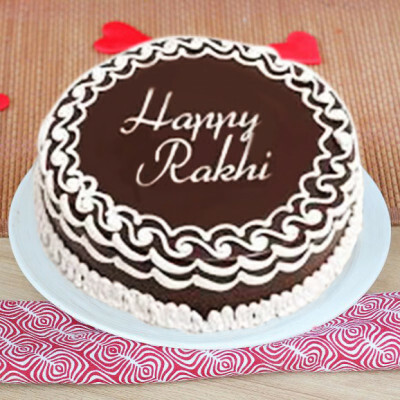 Celebrate your love and care for each other with this delicious cake, paramount to send it to him along with beautiful Rakhi, Roli, and Chawal. If your beloved Brother is an enthusiast of the dark Chocolates, then, he will surely take pleasure in this Raksha Bandhan Gift Hamper. This combo includes an affluent and yummy Half Kg Truffle Cake, a cute Rakhi, Roli, and Chawal. This delicious butterscotch cake is a crucial delicacy for Cake Lovers. This half Kg Butterscotch Cake with Rakhi is basically a tremendous choice. With the rich aroma and flavor, send it along with beautiful Rakhi Roli Chawal that will surely add extra sweetness to your sweet occasion. Gift an absolute combination of Rakhi’s combo as a perfect gift hamper to your affectionate brother which has Roli Chawal in it. This beautiful Rakhi Combo includes Single Rakhi with Roli Chawal and 1 Kg Fruit Cake. When you have a brother to share your love and care with. With each rakhi being the sign of a huge bond shared & enchanting is an individual way of celebrating the occasion. 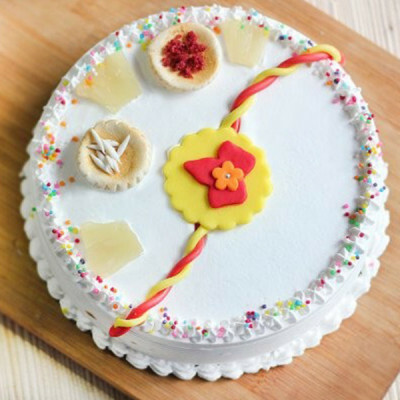 Combine the traditional touch with Half Kg Rakhi Strawberry Delight Cake which is exclusive in flavor & extraordinary in taste. 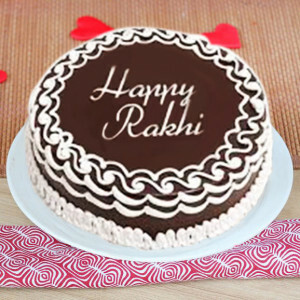 This Raksha Bandhan, illustrate your enormous love, care and warmth to your superhero brother by gifting this delightful and creamy 1kg White Forest Rakhi Special Cake with the attractive rakhi. 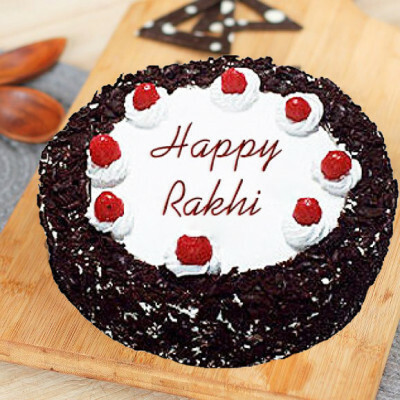 Every sister desires to wish her brother "Happy Rakhi" in an exclusive way. This Angelic strap is the most gorgeous rakhi gift hamper which every sister can convey to her brother on Rakhi event. This divine gift consists of one Rakhi with 12 Pink Carnations in Pink Paper Packing n 500 gm Kaju Katli.